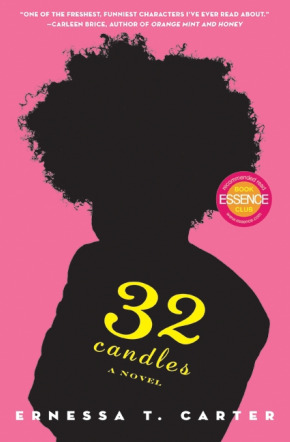 I was doing some traveling a few weeks ago to Virgina and so when my mother suggested that I read “32 Candles’ by Ernessa T. Carter on the plane ride across country. I decided to take up on her offer and it was the best entertainment I’ve ever had 5,000 miles in the air. Traveling time was 10 hours and my eyes barely left the pages, as I read through countless hours cramped on southwest with peanuts and cranberry apple juice. The main character “Davie” was very entertaining, and it was nothing short of a fairytale. The author redefined the “Girls Gets Boy” theory by building the story from Davie’s childhood until her 30’s so I was able to capture her dysfunctional relationship with her mother, to going mute until she moved to LA, and falling in love with her high school sweetheart that she used to stalk. I am not giving anything away at all because the descriptions and witty stories will take you on a roller coaster trough adolescent love, maturity, and life lessons that every women face growing up. I found it very interesting that the author was able to paint a picture throughout the story of Davie’s natural hair. When she was a child it was untamed and everyone teased her about the way she looked but as she grew up and moved to Hollywood she didn’t buy into the perms and wore her hair in a big Afro. It will bring confidence to those who feel discouraged about their own looks. Not everyone starts out as the most popular girl in the school with the blossoming personality and the bright future. It’s not so often you come across black novels that portray the protagonist in such a way that all women can relate it to their own real-life situations. Ernessa T. Carter made sure to let the reader know that your fairytale will come true, you just have to learn to love yourself first and be comfortable in your own skin. So if you are traveling this holiday season, or you are looking for a bit of entertainment to your mind, this will be a novel that you should pick up. Just check it out in the library!